NextSome good news, for a change! CicadiaMania alerted me to the strange pleasure that is Cicada Man, or Semi Ningen. Semi Ningen (Cicada-Human) is a character from a very odd 1966 Japanese TV series, Ultra Q. SN is sent to earth (disguised as a human man) by evil alien Cicadas. He is instructed to use the monster Garamon to create havoc in Tokyo. Garamon was kind of like a fluffy Godzilla. Why there were alien cicadas planning to covertly attack Tokyo by hijacking a multi-story dustmop with violent tendencies isn’t really clear. 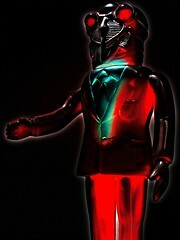 Interestingly, Semi Ningen is quite dapper, featuring a suit and tie as this one does. One would think that a labium and stylets would get in the way of traditional western attire, but apparently it’s better to be a Cicada that looks good than one that feels good. Um. OK, maybe that didn’t explain it after all. You can watch an episode of Ultra Q (Revenge of Garamon) and see Cicada Man. Note to villains: concealing a meteorite in a Cello case is probably not as inconspicuous as you think. Thanks very much to REdYOdA for the use of the SN photo. Oh, man. I remember that party. Garamon was sooooooooo drunk! This would have been a great MSTY3K movie! And what’s up with the flappy fingers?! Also, did you notice that right after Cicada Man stands up the one guy says, “WTF! ?” Really, it looks just like that. Some good news, for a change!